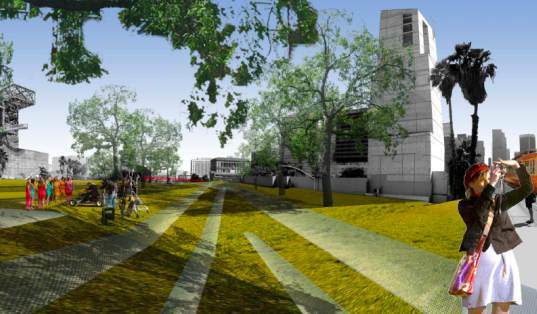 A massive proposal is on the table to create a half mile-long urban park above a section of Highway 101 in downtown Los Angeles. Dubbed Park 101, the proposal would create a roof and park over the 101, which currently cuts a trench through the downtown area and restricts pedestrian access to many important sites in the city. A central downtown park would stitch together the downtown section, increase pedestrian access and invigorate the area. CalTrans is starting to seriously consider the idea — they’re having a community meeting next month to discuss it! As plans stand now, the park would stretch from Grand all the way past Alameda and in certain areas it would extend a little on both sides of the 101. The highway would most likely need some upgrades — it would have to be dug a little deeper and an underground parking lot would be added, in hopes of getting people to leave their cars once they get downtown. The master plan also includes development to place some new signature buildings along the park as well as some additional mixed-use development, like retail and residential, to bring more than just business people to the downtown area. Cost estimates right now are in the $800 million range and the design firm EDW Aecom is working on the rollout plan, which is expected to happen in stages as money becomes available. The first community meeting will be held on Thursday, May 13th from 4-6 pm at the CalTrans District & Building and all are welcome. ...of course budgets are subject to expansion, but even at double the original, it's a cheap enough "fix" for a ruptured community in a world city, and proper planning and cost sharing over time could return much of that through use-fees and rental of spaces, etc. Long-term economic strategies would balance investment in the conversion. The design firm doing the planning is a private firm, Aecom. The actual construction, if this happens, would likely also be bid on by private contractors. CalTrans has to do most of the coordination and approve it (and pay for it), because highways are part of their thing. It really can't get much more private than that. It'll sure be something worth seeing if they do it. I hope it happens. 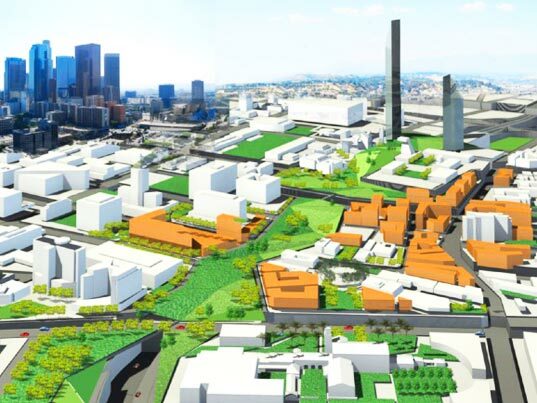 A massive proposal is on the table to create a half mile-long urban park above a section of Highway 101 in downtown Los Angeles. Dubbed Park 101, the proposal would create a roof and park over the 101, which currently cuts a trench through the downtown area and restricts pedestrian access to many important sites in the city. A central downtown park would stitch together the downtown section, increase pedestrian access and invigorate the area. CalTrans is starting to seriously consider the idea -- they're having a community meeting next month to discuss it!